Protecting plants from frost is easier with good garden planning. If you plan your planting correctly, you avoid frost in the garden in the first place. 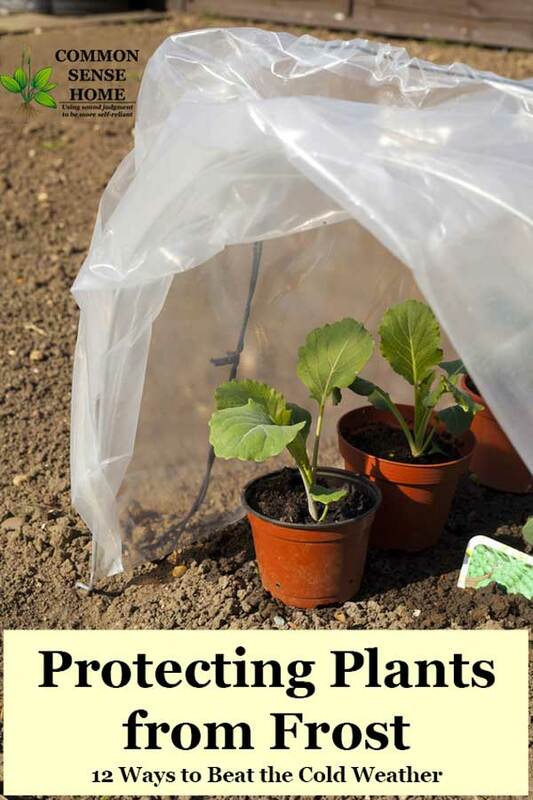 In the unfortunate event that Mother Nature throws your plans out the door, you can add a variety of frost covers for plants to protect them from the cold. In this post, we’ll cover cold weather protection for your garden with good planning, plus frost protection options. Good garden planning and preparation can help avoid the need for frost protection, or be used in combination with frost protection for plants. A microclimate is a small area with a climate that differs from the surrounding area. 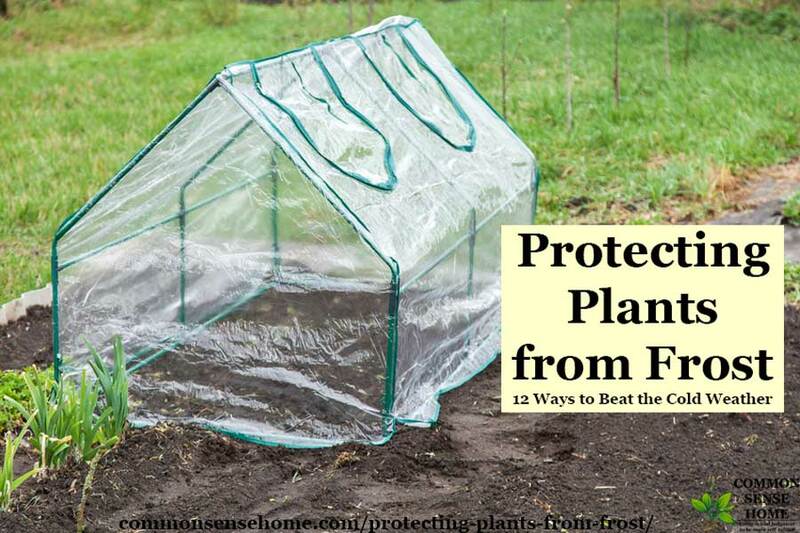 In the case of frost protection, you want to warm the air and soil where you’re planting, and shelter plants from excess wind and temperature fluctuations. A good microclimate can give your garden a boost in spring and fall. In spring, it gives you an earlier start, in fall, it can buy you a few degrees to ward off light frost, especially if combined with elements like floating row covers. Frost tends to settle in low lying areas. If you have a choice in elevations for your garden, opt for a higher spot to avoid low lying frost. My gardens are a great example. Our south beds are around 20 feet lower than the beds on the north side of the house. The south beds will freeze while the north beds are still intact. The north beds are more exposed to the wind until our treeline gets taller, so there are pros and cons to both locations. If you don’t have a high spot to plant your garden for frost protection, make your own. Raised beds heat up faster and stay warmer. (For those who face the opposite problem (too much heat) planting in troughs can provide cooler temps and wind protection.) Raised beds tend to dry out quicker, so plan accordingly with watering and mulch if needed. One old technique for frost protection (and boosting plant growth) was to place partially finished compost or composting manure in the center of a raised planting bed. The heat of the working compost to warms the soil for planting. Don’t plant your seeds or transplants directly in hot compost, as the heat and excess nitrogen can kill plants. Another way to add heat to your soil is to cover the ground with plastic or other dark material. This raises the soil temperature so you can transplant earlier. Preheating the soil promotes better germination rates and easier transplanting. Clear plastic warms the soil well, but can promote weed growth if it isn’t hot enough. Black plastic mulch is commonly used, as it is cheap and blocks weed growth. Recently, IRT (Infra-Red Transmitting) plastic mulch has become available, which blocks visible light but allows infrared light to pass through. I always use black landscape fabric in my melon patches. Depending on the season, I may also do it for other heat loving crops such as cucumbers, tomatoes, summer squash, and eggplants. 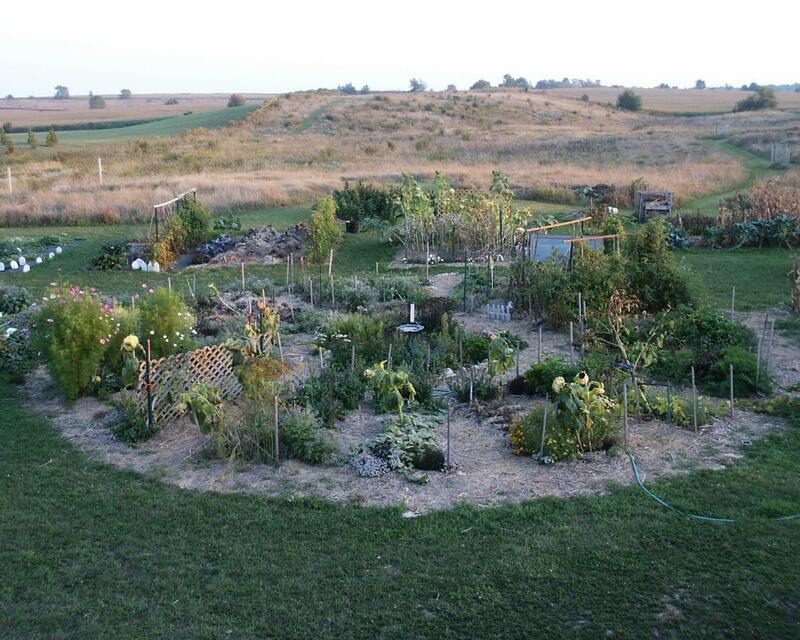 Some plants, such as corn, might like warmer ground temperatures to germinate, but cooler temperatures while growing. Make sure to check preferred growing temps before you put down soil covers. Even when air temperatures are above freezing, ground temperatures can lag behind, so don’t rush to plant too early. Figure out the average date of last frost in your area by checking with your local extension office or researching online. Then check the seed packets of your desired crops to see which ones are best started inside before setting outside as transplants. Count back from your average last frost date the appropriate number of weeks to determine your indoor planting schedule. *Note: Don’t forget to check whether your seeds need to be stratified to improve germination. Stratification is the process of placing seeds in cold storage for a time to mimic the natural freezing process. This is more common for herbs and wildflowers. For instance, many slow growing herbs and flowers suggest starting indoors 10-12 weeks before last frost. Tomatoes and peppers may suggest 4-8 weeks before last frost. Vine crops may be started inside 1-2 weeks before last frost (if the plants get too large they do not transplant well and are more likely to get transplant shock and be set back). 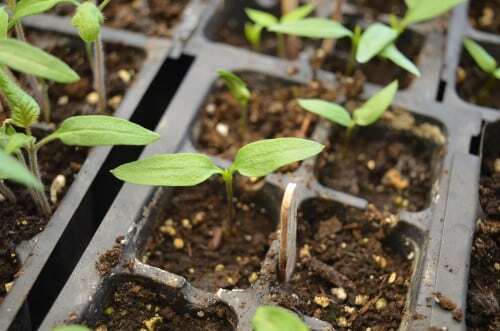 You can also start seeds for fall plantings inside when it's too hot for them to germinate outside. One of the cheapest, easiest frost covers you can make is to cut the bottom off of a gallon plastic jug, such as a vinegar jug. Simply slip the jug over your seedling and wiggle it gently into the ground. 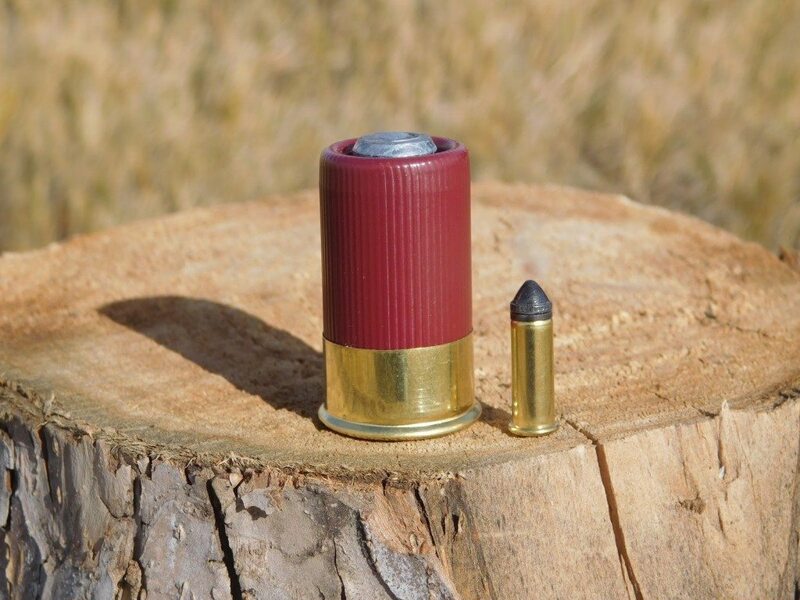 If it gets warmer during the day, open the lid for ventilation. When the danger of frost is past, remove the cover for a few hours each day, extending the time left uncovered slowly to give your plant a chance to adjust. If you’d like an option that’s a little more attractive, gardening supply stores sell glass or plastic cloches in a little bell shape with handle for easy use. The wall-o-water is a series of plastic tubes connected into a cylinder that fits over your seedlings. The tubes are filled with water. 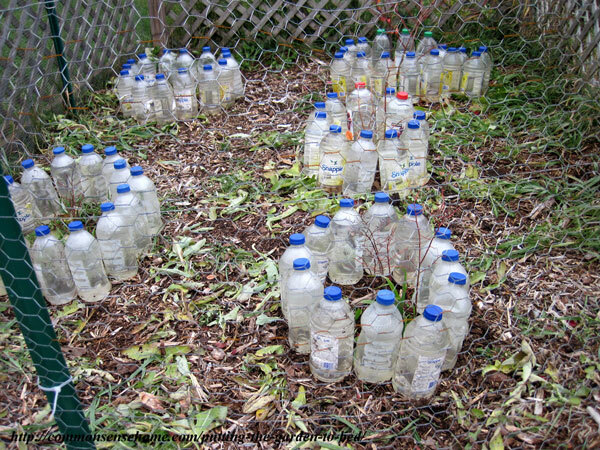 When the temperature drops, the water in the plastic tubes freezes instead of your plants. If fall frost is threatening to cut your harvest short, an old blanket or tarp can be draped over plants for frost protection. 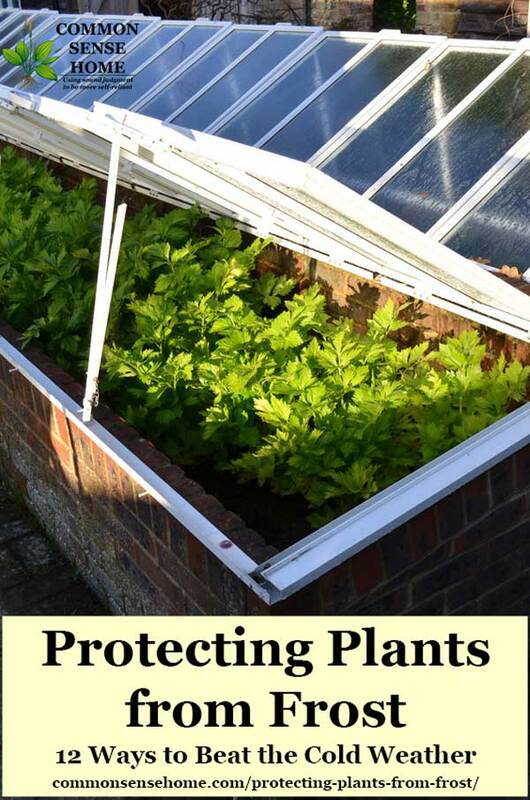 An air gap between your plants and the frost blanket adds more protection. You can add the air gaps by combining the frost blanket with a hoop framework to form a garden low tunnel. I have a friend in a slightly warmer climate who keeps cold tolerant greens growing in her garden tunnels all winter long. Can I cover my plants with plastic for frost protection? Yes, sometimes plastic is used for frost protection. For instance, on low garden tunnels, high tunnels, garden cloches and greenhouses. You need to be careful that your plants don’t overheat when the temperature goes up, because plastic doesn’t breath like garden fabric. You also have to watch out for moisture buildup inside plastic covers, which can increase the risk of fungal diseases. 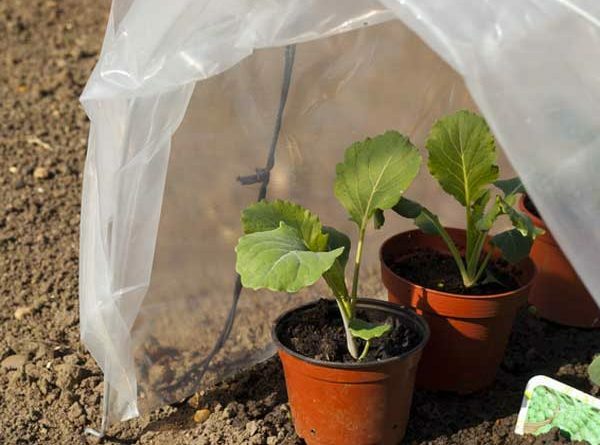 For a small garden, sometimes a mini greenhouse is all you need for frost protection. These little kits are relatively inexpensive and set up in minutes. Just make sure to anchor your mini greenhouse securely so it doesn’t get caught by the wind and whipped away. 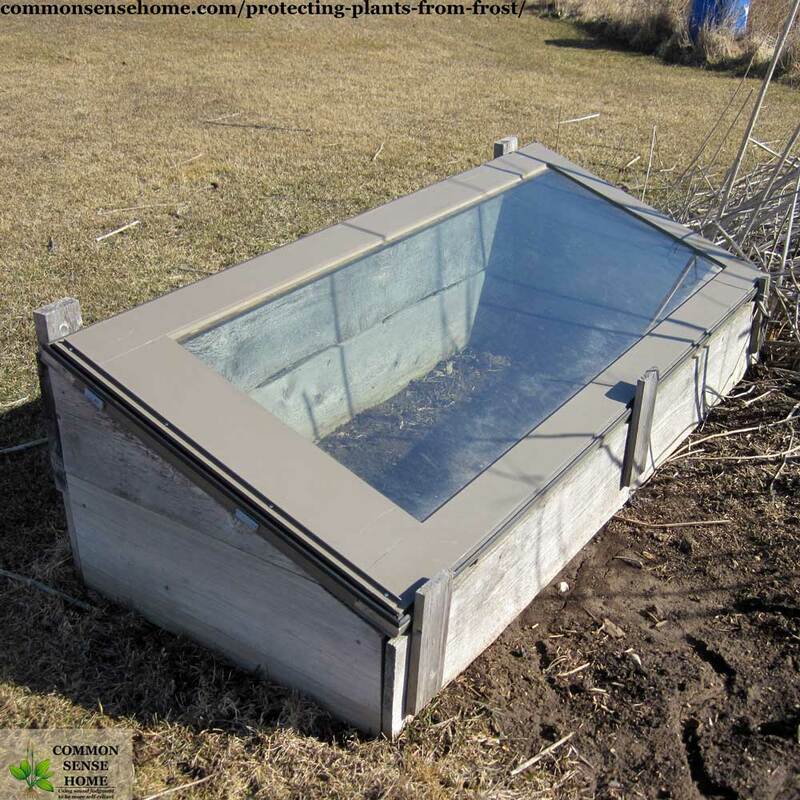 A cold frame is a box, typically with opaque walls and a clear cover. 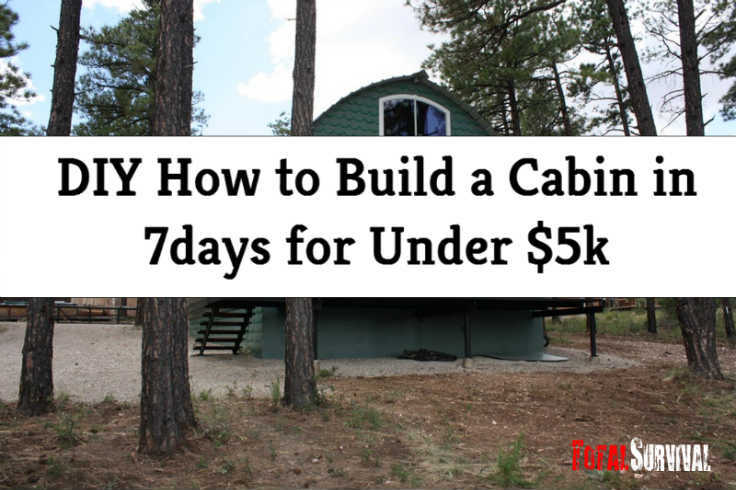 It can be simple, such as an old storm window over a rectangle of straw bales, or a custom built wooden frame and cover, or a pre-packaged unit. 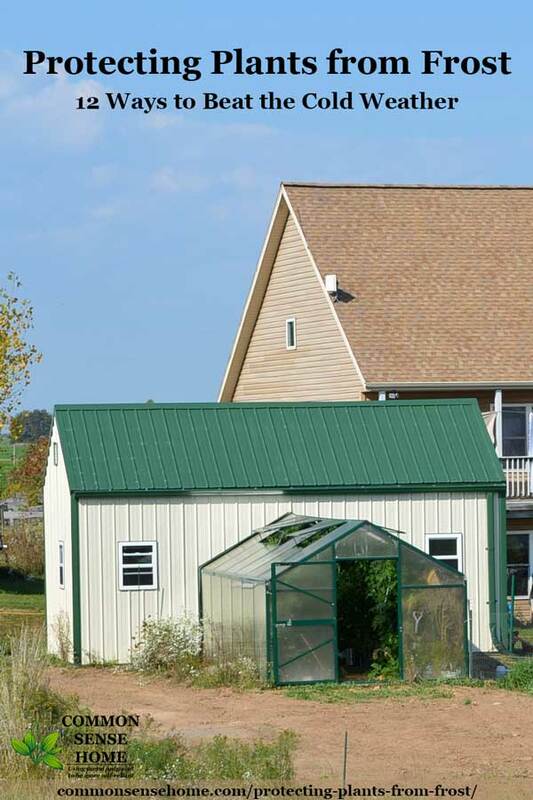 Most home built units are lower in the front and higher in the back to allow more sun to reach the plants, and sized to accommodate whatever used windows are available. The fronts should be at least eight inches tall so that you have room to accommodate some plant height. We have two cold frames sized to fit old patio doors. *Note: Make sure any old windows you use do not have lead paint on them. Obviously, that’s not something you want around your food. Cold frames are unheated (except for by the sun). Their primary advantages are to protect from the wind and overnight cold temperatures. When using them (as when using a greenhouse), be careful to vent to avoid overheating on sunny days. I have a small greenhouse attached to the southeast corner of our home. We also added a detached greenhouse in 2015. 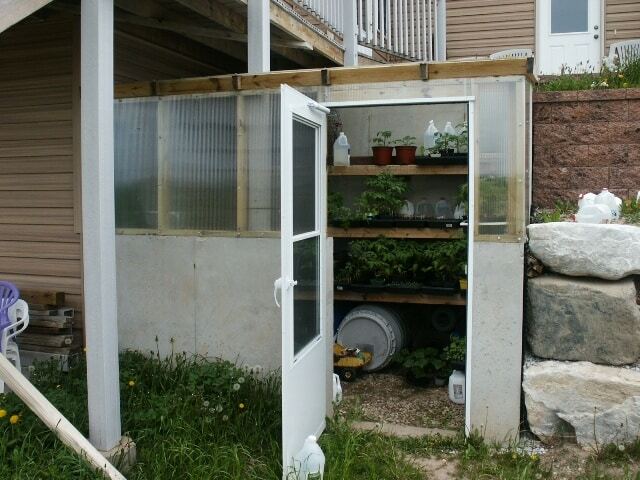 I transition plants from seed starting shelves inside, to the greenhouses or the cold frames, to out in the garden. The greenhouses have allowed me to significantly reduce the time the plants spend under grow lights. Our attached greenhouse is a simple wooden frame covered in multi-wall polycarbonate, and is built into the hillside as part of our retaining wall so it is earth sheltered. Our detached greenhouse is also multi-wall polycarbonate, and sheltered at the north end by a combination coop/garden shed. Multi-wall polycarbonate provides more frost protection than single wall plastic or poly covers. Many different sizes and types of greenhouses are available, depending on your space and budget. A greenhouse may or may not have supplemental heat. See also, “The Forest Garden Greenhouse“. 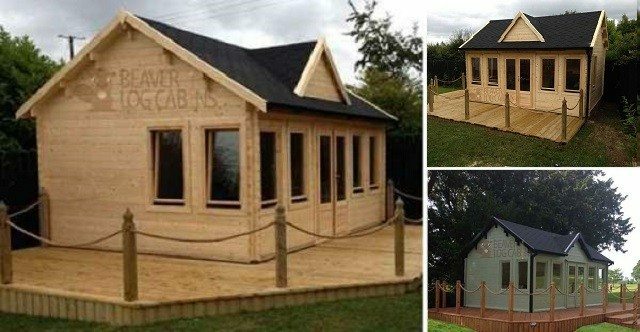 If you'd like more information on building a greenhouse, check out how we built the foundation of our detached greenhouse. The video below features a greenhouse built from recycled materials. We’ll also be reviewing a Harvest Right greenhouse later this year, and August is working on a dedicated greenhouse post that will be on the site soon. Keep in mind that many crops will tolerate cold weather, and some (like kale) even improve their flavor after a light frost. 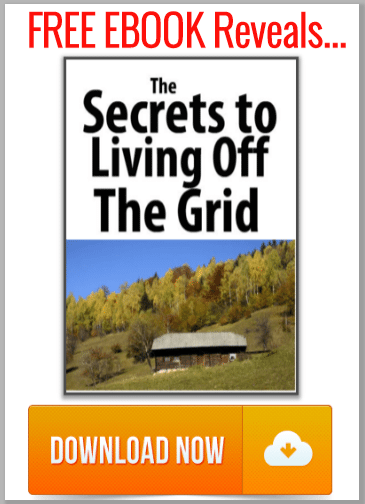 “The Winter Harvest Handbook: Year Round Vegetable Production Using Deep Organic Techniques and Unheated Greenhouses“. I hope you found this post useful. Don't forget to take a peek at the rest of our Gardening Articles. If you need additional information on season extension, I recommend the books below. Originally published in 2013, updated in 2018. 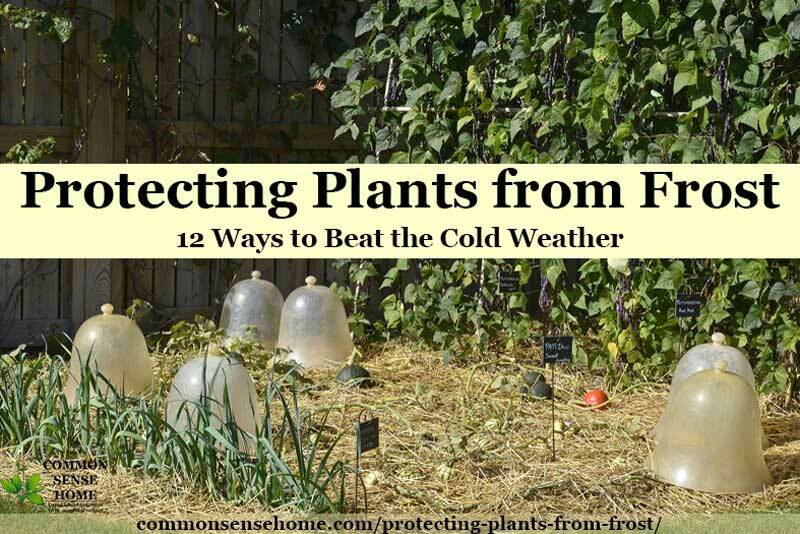 The post Protecting Plants from Frost – 12 Ways to Beat the Cold Weather appeared first on Common Sense Home.